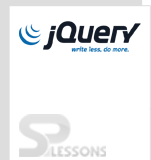 In jQuery, some of the most basic components are used to manipulate. When it comes to DOM element, jQuery properties or jQuery attributes assign by the element. In this element tag name is a and attributes represents href, target, id, class, title each of which consists of a name and value. jQuery easily access the attributes of elements and manipulate the attributes of elements. So that, one can easily change the properties or attributes of elements. The attr() method can be used to either get value of attribute from the specified element or set a value of attributes onto all matched elements. The attr(name) method can be used to select the value of attribute from the specified element of the document. In below example, get the value of title attribute from p element. The attr(name, value) method can be used to set the value of name attribute from specified element of HTML document. In below example, the value of href attribute from a tag of HTML document changed.